We all know that Testors runs like a race horse, what do you do to keep the beast under control? But yeah, after the first thin coat, wait a few hours. I prefer painting my parts on a surface so I can touch the surface to check if the paint's dry. When you feel no tackiness, carefully touch an area of the bot part that can't be seen or rarely seen. Only do this if you're really sure the paint's dry. About a day's wait will do, if you're unsure. Once your sure that the first coat is dry, go and apply the second coat. You can be more liberal with the painting here, but remember little goes a long way. Generally, thin coats are the best way to get a perfect finish for your bot. I'm from the "super thin coats" club. My issue lately is those little "dots" that form because it's spraying propellant instead of paint. It almost seems like if you use more than 50% of a can, you just end up with ever diminishing results. Yeah, they look like popped air bubbles, right? I got that as well. Slow and steady, I guess. Additional coats can certainly hide them. Has anyone used a plastic adhesion promoter on their parts? In the past, especially on my Crow, the paint has chipped like a son of a bee. I'm hoping to avoid that on my new builds. For Crow I take some steel wool and sand paper and sand down the heck out those darn floraliers! for Crow I use Gray primer, a couple coats of rustoleum plain metallic gold, and finish it off with Testors Lime Gold Metalflake. Highlighted with Flat Back accents. For Servo I use Gray Primer, Rustoleum Painters touch Gloss colonial red, and Testors Red Metalflake, I hand paint my beaks, and engine block pistons. For Gypsy I'll probably use Gray primer, Rustoleum Gloss purple, and Testors Purple Metalflake, for the Lip I'll use Rustoleum gray vinyl spray paint. I'll also paint red ones too. I picked some of this up for some paint testing. It seems like it'll be a good undercoat, and in my eyes, it already looks pretty close to the shade movie Crow was rocking. For touching up flaking bots I buy glass vials of Testors metalflake paint model paint, and use a makeup brush because of it's very fine bristles and hand paint the parts that have paint flaking off. Testors is incredibly easy to work with and it won't run if you practice proper painting techniques. Temperature is key. It's best to only paint when it's dry and 55 or above. Sweeps. Use sweeps. I don't know how many times I've seen nimrods try to point the can at the item and just hold down the trigger. Study and practice automotive paint application techniques and replicate that using spray cans. When you sweep, start at the far left of the object, begin spraying, then move the can past the object and COMPLETELY off to the right side. Never start and stop spraying your application while the can is pointing at the object. This creates overspray areas that compromise the finish. You should only hold the nozel for about 2-3 seconds while you do a pass. This prevents you from spraying too much paint or not spraying enough pigment in the mixture. Any time you stop and start spraying again, ALWAYS clear the nozzle by spraying off to the side for a second. This will clear any buildup that might cause runs or uneven pigment distribution. Also remember that the final finish coat is the one that really matters in terms of completion and accuracy. If you want Tom to be that Metal Flake Red, you only need one good coat of it. The coats underneath can be any gloss red paint. For beginning coats, don't bother with testors at all. Use something that rapid-dries, like automotive touch-up paint. It literally dries within seconds, so that will cut down on your work time a lot. It doesn't hurt to use a clear coat for the final application. It will help work over any inconsistencies in the final paint application. This also allows you to buff out any overspray spots after you let it set for a few days and fully cure. My usual application method is this direction: 1500 grit sanding > Ahesion Promoter(acetone spray, basically) > Tamiya white primer(or rustoleum auto primer as a back up) > Dupli-Color or Rustoleum brand basic coat(red, gold, etc) in at least two coats > Two coats of the final color > one coat of sealer, buff and finish after a week of curing. I NEVER use a full enamel as the second coat before the final. There's no reason to. It only needs to tint the primer, it doesn't need to have a full finish. If you want to lay out the cash, there's a great line called Army Painter. They're basically fast-dry primers that come in assorted colors which are ideal for this sort of thing. They just cost $15 a can at most hobby shops. They're virtually idiot-proof. I also don't recommend using steel wool to abrade the plastics. Crow's body parts are made from the trademark Tupperware blend of polyurethane and polyethylene, but using steel wool and such will only gouge the plastics. That plastic is not designed to corrode, so anything that rough will just cause bunching and drags on the surface. Instead, use 1500 grit automotive finishing paper. It will give it a soft satin finish that's easier to paint. Once you apply adhesion promoter, the paint should bond fine. INCREDIBLY EASY TO WORK WITH?!?!?!? WHAT UNIVERSE DO LIVE IN WHERE THE THE RULES OF PHYSICS ALLOW FOR YOU TO PAINT EASILY WITH TESTORS?! Darko is right about the painting techniques. I used to do auto body painting back in my youth. The trick is to always keep the can moving doing nice even back and forth sweeps with the can and stop spraying at the end of each sweep. The trouble with the Testors is it sprays like a firehose sometimes so you have to do slightly faster sweeps. Also you have to give the paint a chance to "lay down". You may do a couple of sweeps and the paint still looks bumpy and not smooth so you keep spraying until it looks smooth and glossy and then you put too much paint on and it runs. But if you just do a couple of sweeps until the surface is evenly covered then stop and watch you can see the bumpy texture of the paint gradually smooth out and become flat. I've been using the Testors for many years now and never get runs in my paint jobs. The biggest issue right now is what Ron mentioned. 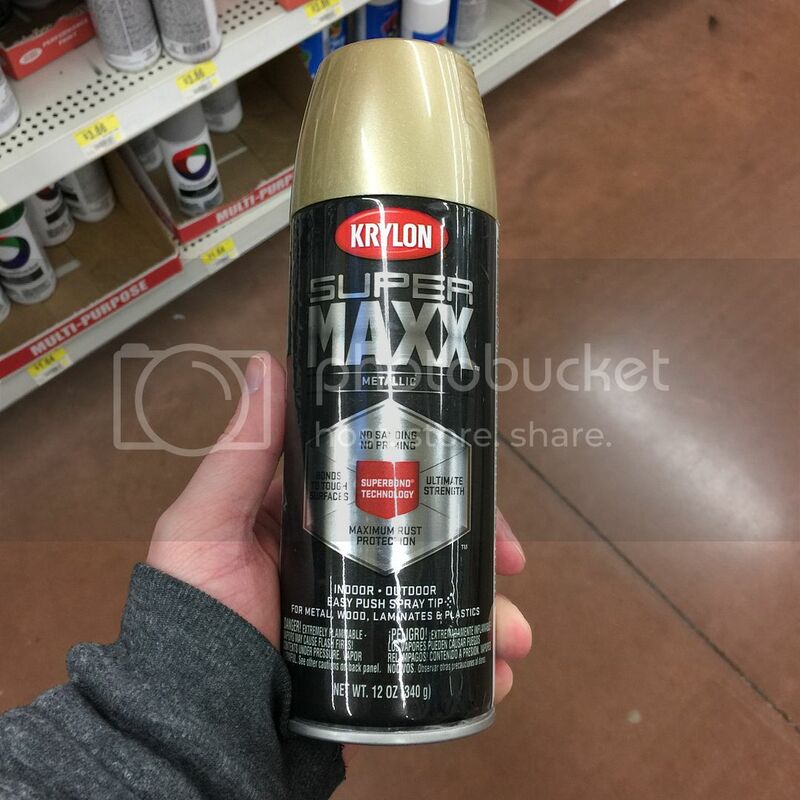 Over the past 4-5 months the cans of Testors Lime Gold that I've been getting have been randomly "spitting" globs of propellant or some other impurity on to the paint surfaces. At first it was maybe one or two cans in a batch but with my last order of paint every single can did it. Very annoying. And just recently some of the Ruby Red paints have been doing it. The biggest problem I've had in the past is where Testors decided to only put 10% paint and 90% propellant in the can.... so you're painting away, using a good side to side swiping technique, and then you're screwed by a manufacturing defect. Heh. Temperature and humidity can help with that. It has to do with the flakes in the paint. Yeah, a couple weeks back I bought some paint to do a repaint of Servo plus a new head that I bought. It always seems that either the propellant runs out before the paint is completely gone, or the paint runs out and and the remaining propellant causes the leftover globs and drops to spew from the nozzle.